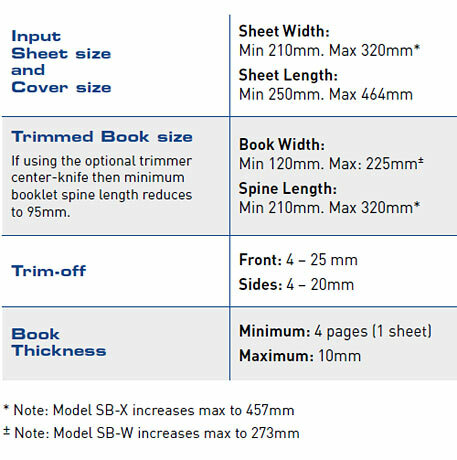 The Smart-binder SB-1 and SB-2 provide wire stitching only of booklets up to 10mm thick. The SB-1 is a lower speed version of the SB-2 for use with slower speed digital printers. The sheets are side registered, center-scored, plow-folded onto the Smart-binder saddle and collected together. After wire stitching then each booklet is 3-side trimmed before being delivered on a conveyor in a shingled stream. The Smart-binder SB-3 includes the option of ISG cold-glue binding as an alternative to wire stitching. A code printed on each sheet is read on the Smartbinder infeed. The numerical data in this code enables the Smart-binder to track each sheets into correctly assembled booklets and automatically perform other functions as needed. The SB-4 and SB-5 models add a 'perfect-binder' module to the Smart-binder to produce high-quality perfect-bound books up to 60mm thick. 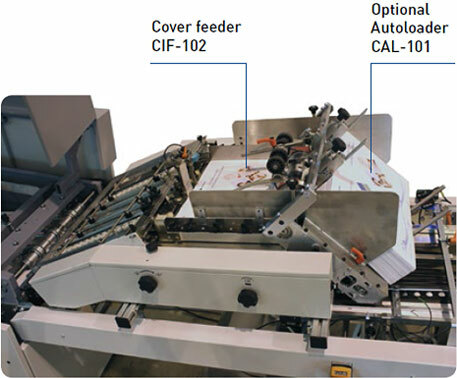 The optional Cover Feeder CIF-102 automatically feeds a cover sheet on top of the last sheet of each booklet. An Insert sheet may also be fed at any position inside the booklet. An optional code reader may be used to check that covers or inserts match the other sheets in each booklet using a coded ID number printed on both the inside sheets and the covers. The Cover Feeder may be fitted with an optional Auto-loader CAL-101 which increases the maximum cover pile height from 20mm to 200mm. An additional cover or insert sheet feeder CIF-101 is available in case both a Cover and an Insert sheet feeder is needed, or two Cover feeders are needed. A rotary disc collect sheets in groups and then drops these onto the saddle. 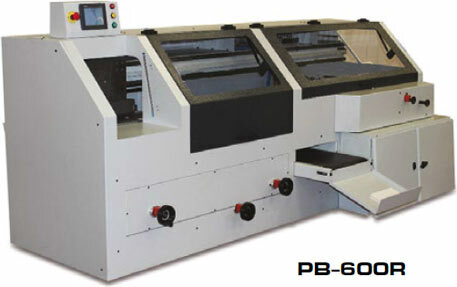 This system allows the last sheet (or cover) of the book to be closely followed by the first sheet of the next book, which avoids the need for the printer or web cutter to pause when running in-line. Up to 6 Hohner wire-stitch heads may be fitted. 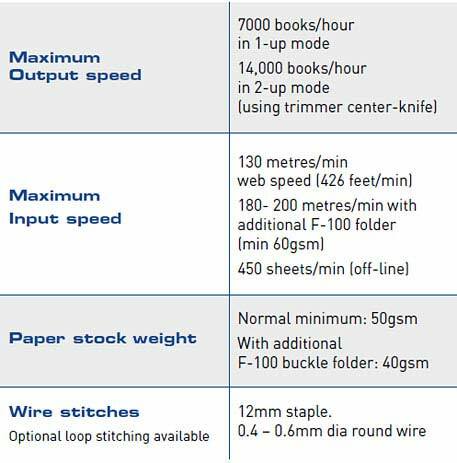 A special drive system ASA-100 may be used to automatically adjust the staples to match the book thickness. The optional stop-stitch system SDI-100 deactivates the stitching process automatically under bar code control, when not needed. Optional loop stitching (Omega/Ringoesen) is available instead of normal flat stitching. 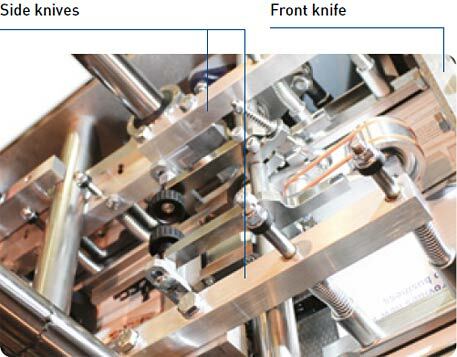 An optional cold glue applicator nozzle applies a row of glue dots to the inside fold of each sheet and cover (models SB-3 and 4 only) as part of the folding process. 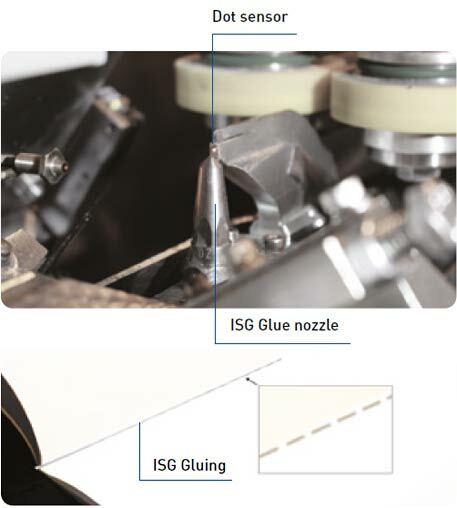 This unique cold glue binding option ISG-100 provides a higher quality alternative to conventional wire stapling and is a patented IBIS solution. 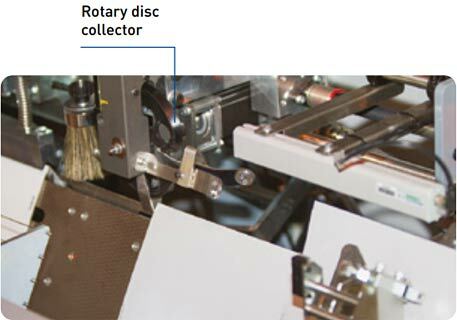 A light sensor detects each dot of cold glue and stops the Smart-binder immediately if the nozzle is blocked to ensure only correctly bound booklets are produced. After gluing, the sheet and cover are pressed together to ensure a high quality bind. ISG cold glue binding offers a stronger bind, better booklet lay-flat, and an easier-to-use alternative to conventional wire stapling. The SB-3 can switch automatically on-the-run between wire stitching and ISG cold gluing, under bar code control. 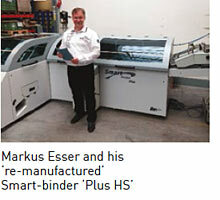 The Smart-binder is normally supplied with a heavy-duty 3-knife book trimmer, capable of cutting books up to 10mm thick. Alternatively just a single (front knife) trimmer, or no trimmer, may be used. Trimming may not be required if producing signatures for perfect binding or thread sewing. 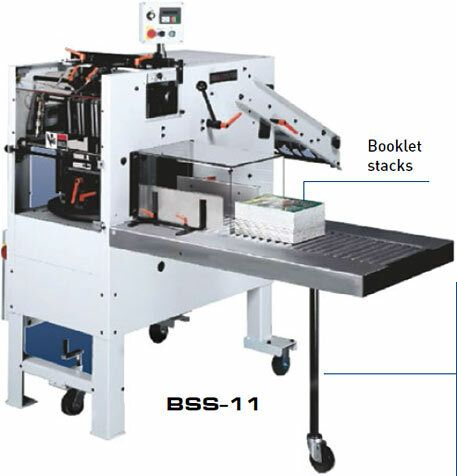 The unique book transport system allows book thickness to be continually changed without having to stop the machine for manual adjustments. 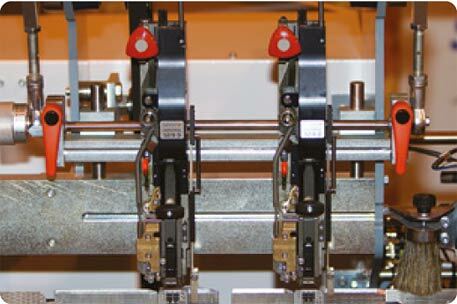 An optional special spine clamping system may be used to eliminate book spine corner tearing when making thick booklets. Booklets are delivered in a shingled stream on the delivery conveyor. Batching gaps are created automatically in the stream to create a pre-determined number of booklets in each batch. 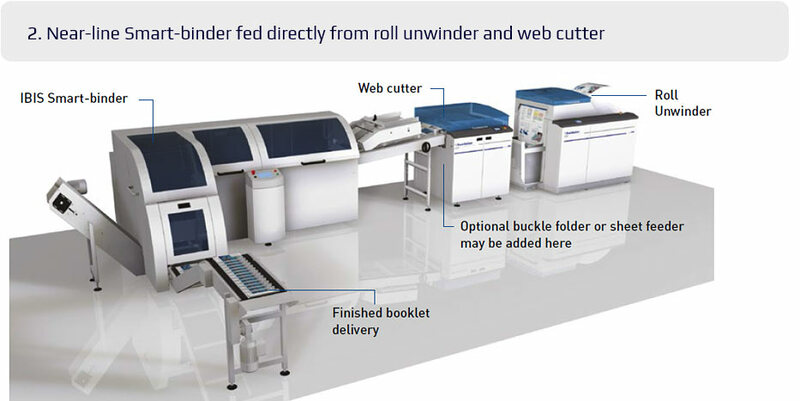 Alternatively the booklets (or signatures) may be delivered into a downstream module such as the optional booklet Stacker, Inserter or Perfect Binder. 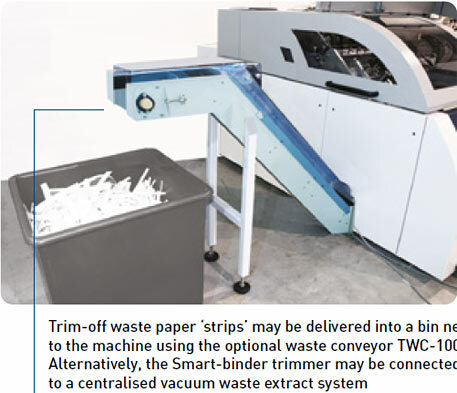 The optional booklet stacker BSS-11 may be connected in-line to the Smart-binder delivery to produce compensated piles of booklets up to 330mm high. This provides operator-free system operation for long periods. 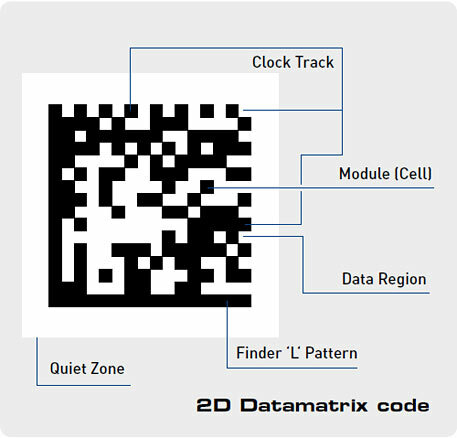 A bar code or 2D reader reads a code printed on each sheet. The Smart-binder then tracks each sheet through to complete booklets. The number of sheets may vary from one booklet to the next to allow personalised booklets. 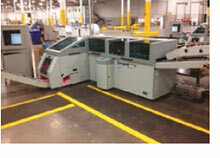 An automatic reject gate diverts any incorrectly assembled booklets into a reject bin. Booklets are rejected if the page sequence is not correct (or if there is a risk it could not be correct), or if they are not of the required quality. The optional Smart-data Analysis System (SAS-100) displays all Smart-binder performance data recorded over selected time periods and may be linked to combine data from multiple machines. 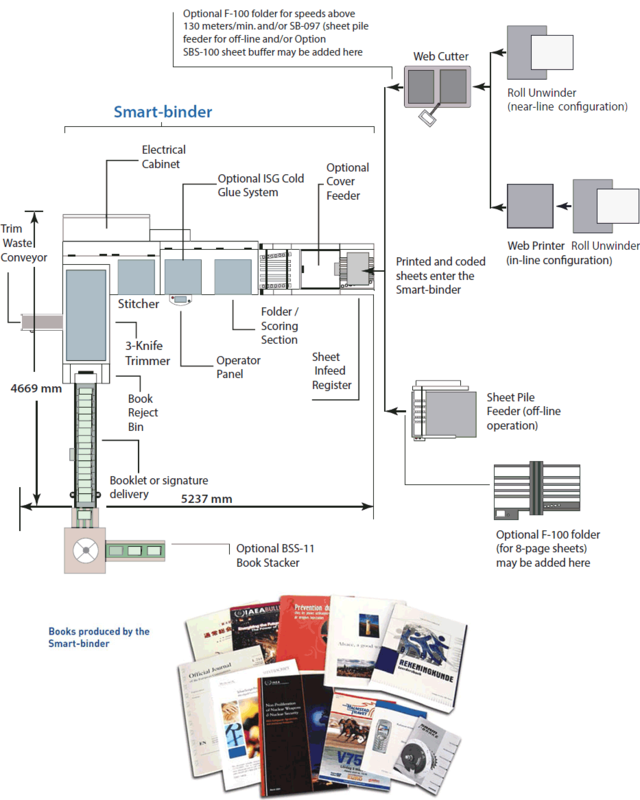 Smart-binder systems SB-4 and SB-5 include an in-line perfect binder in order to produce books up to 60mm thick. The perfect binder (either the single PB-600R or 4-clamp PB1200R) may be connected directly to the Smart-binder delivery (SB-4) or may be fed directly from the web cutter (SB-5). Two different high-pile sheet feeders are available. These may be loaded with up to about 7,000 printed and coded sheets. Feeder version SB-095 is used if the system is to be always fed off-line from the sheet feeder. Feeder version SB-097 allows feed from an upstream web cutter (near line or in-line operation) in addition to off-line feed from a sheet pile. 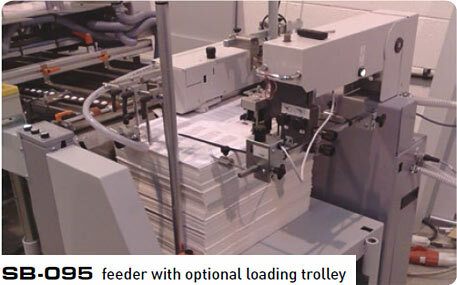 The SB-095 feeder may be provided with an optional loading trolley PLT-100 to reduce pile reload time to about 35 secs. The optional sheet perforation module DMP-100 or DMP-101 perforates each sheet on demand under automatic bar code control. Up to 4 lines of perforation may be applied to each sheet, parallel to the booklet spine, to allow, for example sheet tear-out. 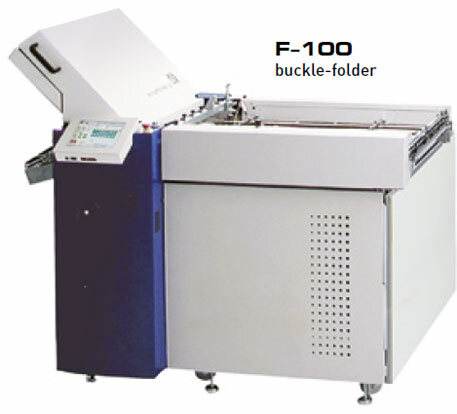 The optional sheet folder sheet folder F-100 may be used to buckle-fold each sheet prior to entering the Smartbinder infeed conveyor. This allows small format booklets to be produced from a large format sheet containing 8 or more pages. 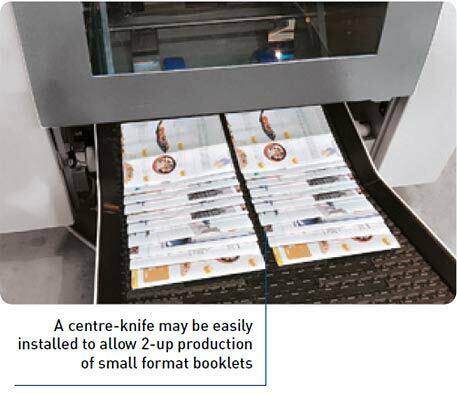 Use of the buckle-folder (without sheet rotation) also allows the minimum paper stock weight to be reduced, or allows maximum web speed to be increased from 130 metres/min up to about 180 metres/min or faster. The folder may also be fitted with a 90 degree sheet rotator on the infeed model RF-100 rotator/folder. This enables small format booklets such as A5 or 5 ½ x 8 ½ to be produced from a web width of 450mm or 18, and avoids having to change to a narrow web. 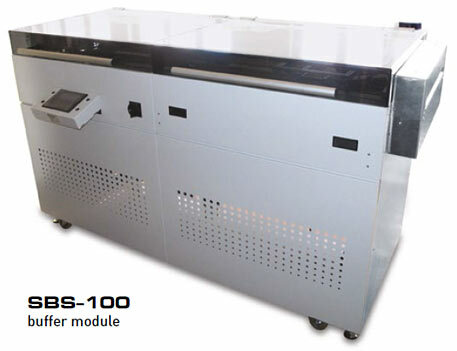 The sheet buffer module SBS-100 receives printed sheets directly from a web cutter. It stores these sheets and then refeeds them one-by-one directly into the Smart-binder (first in/first out). 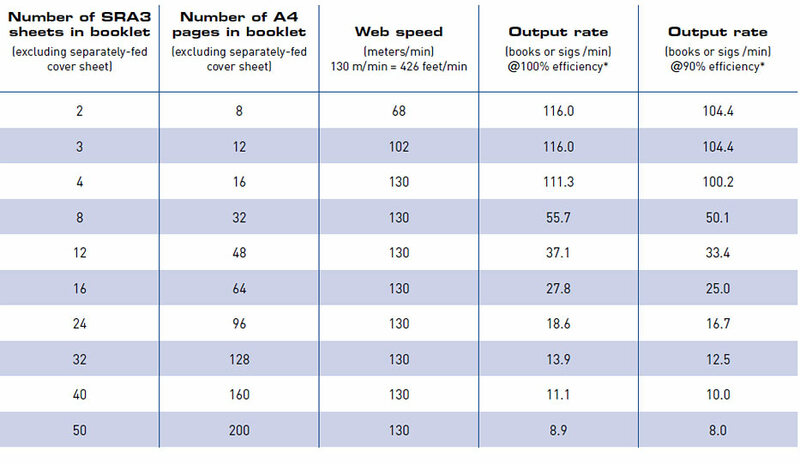 The buffer allows the sheet feed rate to be automatically reduced, for example when making 8 or 12 page booklets, without slowing down the printer. It also allows the Smart-binder to stop for up to 2 mins without stopping the printer, thereby increasing printer running efficiency. Music books, Pharmaceutical booklets, short run magazines, etc. AMF purchased an IBIS Smart-binder SB-3 fed from a high pile sheet feeder to product examination booklets. possibilities which our customers can profit from. One example is the manufacture of handbooks, brochures and product operation manuals with variable On Demand content. The first IBIS saddlestitcher (Digi-stitcher) system was installed at Esser PS 13 years ago and was replaced with a Smart-binder about 9 years ago. 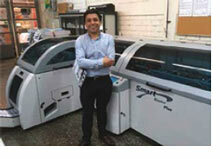 These machines enabled us to fulfil our requirements in the optimum way. We have been pleased with the Smart-binder performance. To expand our digital finishing capabilities IBIS have now installed an additional IBIS Smart-binder, the latest model Plus HS, which is fed from a Hunkeler unwinder, web cutter and MBO folder at web speeds up to 180 meters/min. 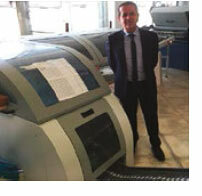 In their print factory close to Limoges, France Maqprint use a unique system using a Smartbinder to produce stitched and trimmed booklets from rolls printed on an HP web printer. I look forward personally to helping you put into operation a complete and highly-effective book-finishing system which will increase your competitiveness and grow your business. For further information, dont hesitate to call me.